GST on Petrol & Diesel? What is the impact on Petrol Prices? You are here: Home / Tax Planning / GST & its impact on Diesel and Petrol prices! 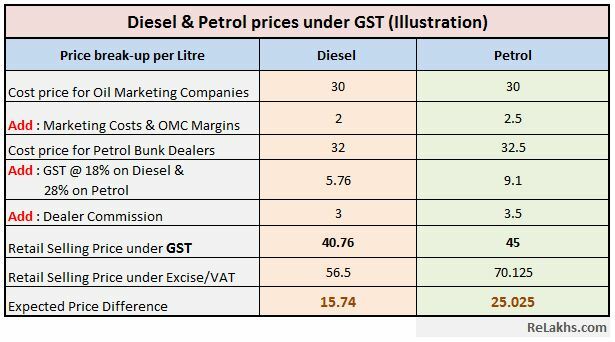 GST & its impact on Diesel and Petrol prices! Decline in crude oil prices helps the government manage its finances better as it translates into lower subsidies on petroleum products (LPG and kerosene), thereby resulting in lower fiscal deficit. 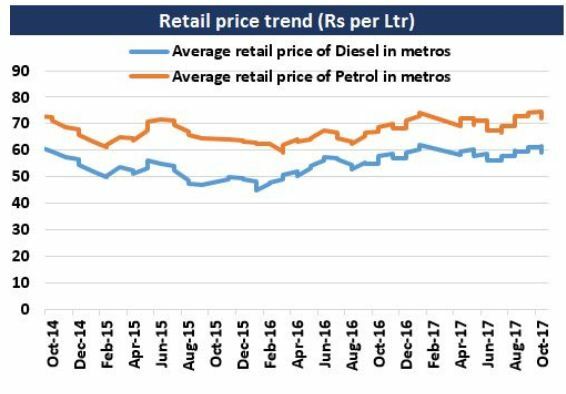 So, when the international crude oil prices have been declining, why are the diesel and petrol prices still high in India? As of now, Petrol and Diesel have not been brought under GST, if they are covered under GST, what would be the impact? Will it lead to reduction of petrol prices and benefit the common man? Why is the Govt dilly-dallying on the decision of including petrol under GST? ..Let’s discuss..
How are diesel and petrol prices calculated? Do you know that ‘taxes & margins on petrol prices exceed the actual cost price’ in India. Yes, this is true! 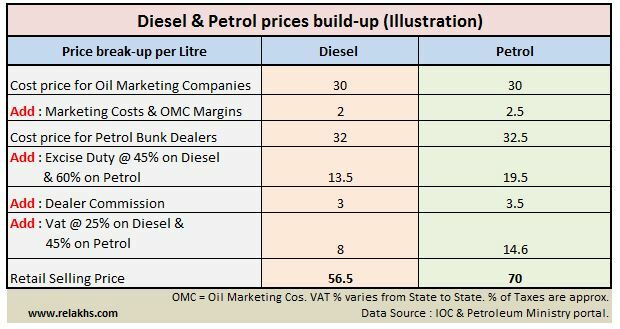 The Taxes on petrol and diesel, in the form of Excise Duty (levied by the Central govt) and VAT (by States) account for almost 40 to 50% of the total cost price of petroleum products in India. So, the central govt and State Govts gets lot of revenue through Excise Duty and VAT/State Sales Tax respectively. So, any reduction in the rate of taxes and duties, will have an impact on the revenue collections of the Govt. Even after recent excise and VAT cuts, prices for petrol and diesel at Rs 70s per litre and around Rs 58 per litre, stand close to their three-year highs. Over these last three years global crude prices have halved from around USD 110 per barrel to USD 56 per barrel. 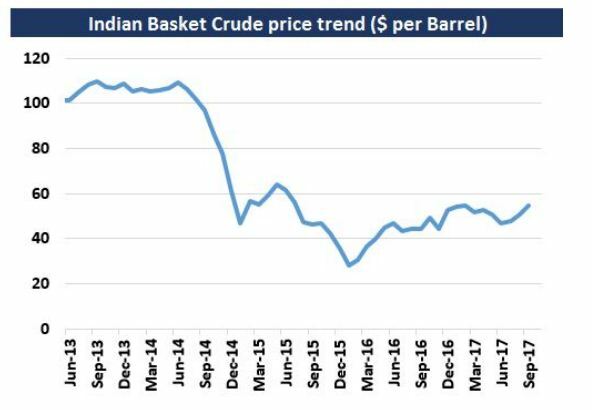 This effectively means that we (Indian consumers) are paying almost the same for petrol and diesel when crude was at USD 110/barrel. In case, the Govt brings in petrol and diesel under the purview of GST , what would be the impact on their prices? As of now, there are four slabs under GST i.e., 5%, 12%, 18% and 28%. Even if we assume Govt to put petrol in the highest bracket of 28%, due to fear of exchequer loss and Diesel in say 18, we can expect lower prices on Diesel and petrol. Let’s now try to calculate the petrol prices under these assumptions. Inflation : The price of oil and inflation are often seen as being connected in a cause and effect relationship. As fuel prices move up or down, inflation follows in the same direction. Inclusion of petrol and diesel under GST can lead to lower fuel prices, which in-turn can pull down inflation rate. 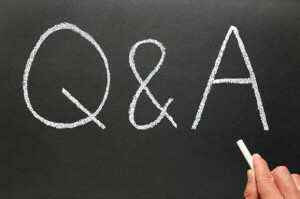 This can have a direct impact on gross house-hold savings and people can have higher investible surplus. In case, the petroleum products are included in GST bracket, there will be huge changes in central and state govts’ tax revenue collections. A mere Rs 2 reduction in excise duty recently amounts to around Rs 26,000 crore reduced collections annually (around 10 percent of total collections from fuels). The State govts will also incur loss of revenues if VAT is abolished. So, the state Govts may not accept the proposal of including petrol and diesel under GST (or) they would like to get adequately compensated for the lost revenues from the central govt. If Govt implements GST for Petrol and diesel, and also compensates the States to certain extent then it will have to take a huge hit on its revenues which could impact infrastructure spending / economic growth. The Govt has to find an alternative source of revenue, until then, I believe that it will continue to play ‘heads I win, tails you lose’ with the consumer. We also need to watch out for the international oil prices. They have recovered more than 65% from their recent low levels in January (2017). However, they are still 60% below their 2014 peak. Going forward, potential supply discipline by OPEC countries and global demand scenario will be the crucial factors that would drive movement of oil prices. I believe that ‘renewable sources of energy’ is the future. The entire world has to aim for a greener tomorrow. We should not depend much on petroleum products. The Govt has to aggressively push for wind and solar power generation projects. How to spot Fake GST Bills? How anyone can prepare GST Returns using Tally ERP.9? Excellent Write-up in Simple words. I have a query. Does inclusion of Petroleum Products under GST would have any impacts on OMCs ? I guess OMC’s will have positive impact of it as lower the prices , higher the utilization/consumption by common man. And as per your analysis , the margins will remain same for OMCs (OMCs could even increase their margins then) and it will be the Government only which will be in losses !! Am i correct ? The current trend with oil prices is upwards (based on demand, production and supply factors). OMCs on any given day will have their margins in-tact. I dont say Govt will be in losses, but it depends on how they will compensate the State Govts, that is the major issue here! If at all they include petrol under GST, they have to find some other way to maintain same tax collections, else fiscal deficit may go for a toss! Government will recover from consumers only if they are going to compensate the states and that too will have impact on inflation !! It is this way or the other , inflation is bound to rise thought the government is trying to keep it in 4 (+-2) range but that looks very tough. The government is also on a verge to cross its fiscal deficit target of 3.2% and that would have negative impacts on the economy . Regarding the Crude prices , with the OPEC declaring to extend oil output cuts until the end of 2018, crude prices can go upto $70/barrel or more . So i think Government is not going to bring Petroleum products under GST atleast for now !! Waiting for your article on Best SIPs for year 2018. Please post it ASAP as starting SIP takes 15+ days to start after application. 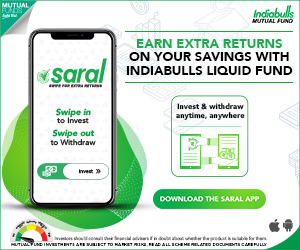 So please post it before 15th December so that I can start SIP from 1/1/2018. Waiting for my article is fine, but kindly dont make your investments wait for it! I will surely publish the article soon. SEBI has advised the AMCs for re-categorization of schemes, hence in dilemma whether to post the article this month or early next year!